The flaw of averages is the term used by Sam L. Savage to describe the fallacies that arise when single numbers (usually averages) are used to represent uncertain outcomes. 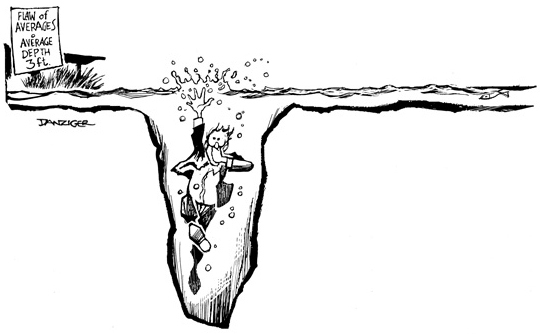 A fine example of the flaw of averages involves a 6 ft. tall statistician who drowns while crossing a river that is 3 ft. deep on average. You can probably see how assumptions using averages can get us in trouble. It only takes a little to be “too much”… and that is mostly likely a problem when we expect the average and the possible range is much wider.